Today is the last day of our Obon holidays, and in Asuke, just north of Okazaki City, the festival ended with Toro Nagashi (とうろうながし / 灯籠流し), a traditional Buddhist ceremony involving floating small lanterns downstream. The village of Asuke, just down the hill from the recently rebuilt Asuke Castle, is located at the junction of two mountain rivers, and the lanterns are floated from an area downstream from the beautiful Kourankei Gorge. 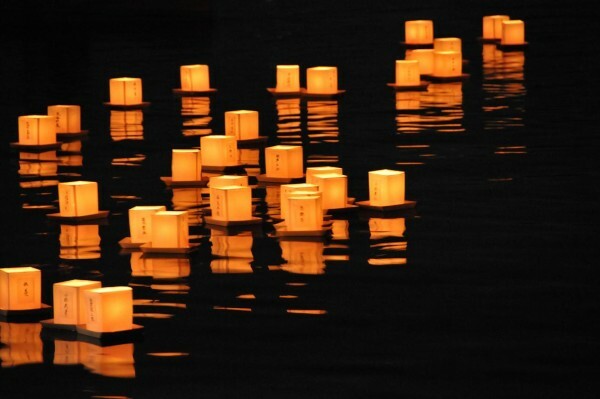 It is based on a belief that the lanterns will guide the visiting spirits of ancestors back to the other world (the connection is water), though the ceremony is not necessarily always held on the last day of Obon. 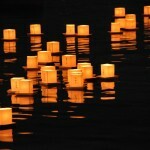 For example in Hiroshima, which is built on the delta of the Ota river, Toro Nagashi usually takes place on August 6th. In Tokyo, the most popular is near Asakusa, on the Sumida river, though there are many other locations. It is a pretty sight, and very moving, though if there is a strong breeze sometimes the lanterns catch fire, in the very same channels where so many of the victims of the fire bombings and atomic bombing sought refuge.